The organisations, Menorquins pel Territori (Menorcans for their Territory) and GOB continue to coordinate their efforts on marine subjects. Now they have asked for some changes in the management of the marine reserve to the north of the island where, because of the deterioration of sea life, it became evident that a study was needed. At the beginning of 2017, the two associations organised an event for the joining of hands at the Tower at Fornells to call attention to the raised situation of clandestine activity detected in the marine reserve. Following on from then efforts were made to involve public institutions and private agencies. 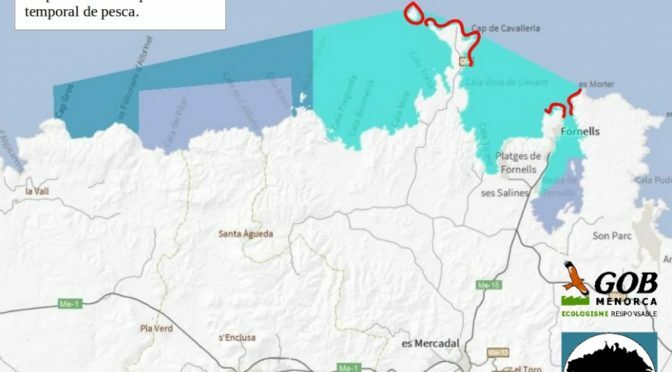 The Balearic Government promised to make a study to find the amount of stock being fished within the protected area and the Consell Insular (the local Island government) promised to organise effective monitoring. The study made during the summer of 2017 by the Balearic Government showed a worrying decline of sea life. No such study had been made since 2011. In the shallowest waters, between 15 and 20 metres deep, the population of grouper fish had dwindled by 80% in the area of greatest protection, and 70% in the rest. The brown meagre fish had reduced by 80% in each area and the tord by 70% and 40% respectively. The marine reserve of north Menorca gives, at the moment, the lowest results in fish stocks of all the Balearic reserves. In the protected area, where, theoretically, it is not possible to fish any type, the level has dropped even more than in the rest which lends weight to the theory of clandestine fishing that tends to go to the places where there are the most fish. Menorquins pel Territori and GOB presented to the Commission for Monitoring the Reserve a series of proposals for reducing fishing to allow regeneration. It must be remembered that during the first years of the reserve, when there was the most effective monitoring, the fish population grew well and so allowed colonisation of areas outside the protected area. That the allowed dragnet length is reduced from the 2000 metres currently to 1000 m, between the dates of 1 February to 30 October. In the zone where fishing is currently allowed in the port of Fornells, it should be reduced to 500 metres, given the size of the Bay. That they are limited to 300 hooks to each longline, both within and outside the port of Fornells. The port acts as a breeding ground and, as a result, many small sized fish are caught. That exclusion zones are established during the fishing season between 1 February and 31 August. Specifically, the Illa des Porros, Punta de Cavalleria and the area to the east and west beyond the Port of Fornells. It is requested that the exclusion zone is made on the basis of the distance from the coastline and not on depth because, this way, monitoring it is much easier to plan. That the days allowed for recreational fishing are reduced significantly. It seems that in 2017 there was an increase in the number of monitoring agents who were able to be more effective by coordinating their different groups better. The Consell Insular has promised to expand marine monitoring for 2018. The objective of these initiatives of Menorquins pel Territori and GOB is for the marine reserve to act again as an area of regeneration of the marine life and to allow the repopulation of other species. It must be remembered that different studies conducted in the waters near Menorca always mention the well conserved ecosystem, but that, outside the areas which have a degree of regulation, there is a large pressure of fishing coming from different places. There ought to be a heavy obligation to regulate this activity, as much on professional fishermen as on recreational ones. At least those areas that are well protected can be taken as examples to follow. For these reasons, the announcement of a new marine reserve in front of the Illa del Aire has been received with the hope that the possibilities of better regulation will be improved for that part of the sea along the Natural Park of l’Albufera, from Addaia to Es Grau.